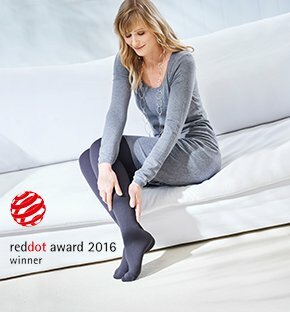 The flat- knitted medical compression stockings Lastofa Forte with Merino wool from Ofa Bamberg were awarded the Red Dot Award. Around 5,200 entries from 57 nations had been received for the international design prize. Lastofa Forte could on account of its innovative character set itself clearly apart from other entries and thus convince the jury in the category product design. Following the award received in 2012 for the elegant compression line Memory, it has now for the first time been flat-knitted compression stockings from Ofa Bamberg that have won the coveted design prize. For the complex and protracted treatment of edema, scars and burns with flat-knitted medical compression stockings Ofa Bamberg with Lastofa Forte offers an innovative product in comfort and appearance. A fusion of high-tech and naturalness combines for the first time the finest microfibers and refined Merino wool in a compression stocking. Although thinner than a human hair, Merino fibres are at the same time robust and pleasantly soft. Air cushions on the inside allow the skin to breathe. They cool in summer and warm in winter.